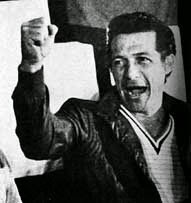 Twenty-five years ago, on November 11, 1989, the FMLN guerrillas launched their "final offensive" with a surprise attack on the capital city of San Salvador. The city had largely been spared from the fighting during the preceding 9 years of war, but now the guerrillas brought the battle even to the wealthy neighborhoods of the capital. The armed forces had been caught by surprise, but eventually would be able to repel the attack after three weeks of fighting. It was a time which would find the army high command reacting by ordering the massacre of Jesuit priests. This video news report (in Spanish) provides footage from that first week of the offensive. The Constitutional Chamber of El Salvador's Supreme Court has struck again in favor of increasing the rights of individual voters in opposition to the power of political parties. The Chamber handed down a ruling on November 5 striking a provision of the electoral code which prohibited "cross voting" in elections for deputies in the National Assembly. Before the court's ruling a voter who voted for one candidate could not cross over to vote for any other candidates of the other parties or an independent candidate. Over this past weekend, Salvadorans celebrated the memories of their departed family members by visiting cemeteries and graves on the Day of the Dead. But for many many Salvadoran families, this is a time of deep pain because their loved ones have disappeared in El Salvador's endless violence and their bodies have never been found. A poll released last week by CID-Gallup, showed the FMLN's candidate Nayib Bukele with an 18 point margin over his closest challenger, Edwin Zamora of ARENA. Bukele led 43% to 25% with 32% of respondents expressing no opinion. I think it is a little too early to assume that the FMLN has an easy path to retake the capital city. Zamora has to catch up after a late start when current mayor Norman Quijano bowed out of the race at the last minute. The political leaning of San Salvador is not easy to predict. The current lead of the FMLN contrasts with the landslide victory of ARENA and Norman Quijano in the mayoral race in 2012. Earlier this year, Norman Quijano garnered an 11% advantage over Salvador Sanchez Ceren among votes cast for president in San Salvador. There are four months to go before the March 1, 2015 elections of mayors and deputies to the National Assembly.